Dining highlights for the week of July 16. It has been a while since I last ate at Gaddi’s and was curious about the new French chef. When I first heard about the new chef and also new French front of house team I wondered if the changes were introduced in a bid to secure a Michelin rating. Gaddi’s non-inclusion has always been something I hadn’t been able to understand, was it a French snub of the chef, who was British? From the set lunch menu I had a Risotto with green peas and Spanish ham – one of the best risottos I have eaten in Hong Kong with a fabulous pea flavour. My only complaint: I thought the serving was a tad small. For main I had the Slow-cooked lamb shoulder with Tarbais beans and piquillo pepper. Competently cooked, the meat was fork tender, except for several bites that were unpleasantly chewy (sinew perhaps), and I didn’t think the beans added to the dish or were the best complement. However, it was tasty enough that I did eat everything on the plate. The meal ended on a high with the well-balanced Chocolate Tart with salted caramel sauce and vanilla ice cream. The food was certainly good enough to go back for more but not the wow I had hoped for, maybe next time. 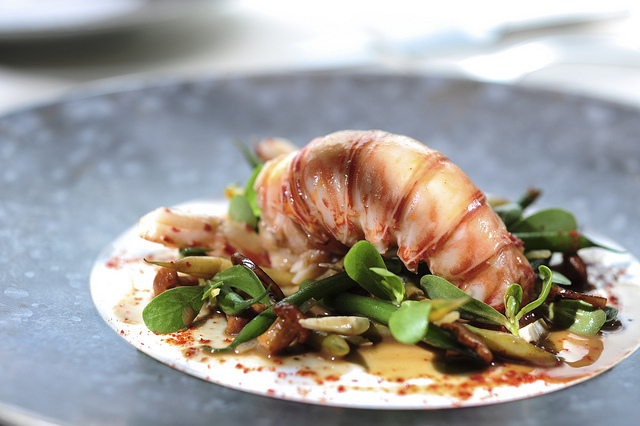 Below are some images of chef Rémi Van Peteghem’s new a la carte dishes. Spoon by Alain Ducasse has introduced quite a number of new dishes to the menu in celebration of summer. I tried five of these on wednesday evening. Standouts: Rock Lobster, french beans, girolles, crustacean jus – fantastic, everything cooked to perfection and the jus had an intense depth that made the lobster sing; Home Made Herbs Pasta, squid and zucchini “Violon” – delicate and silky pasta sheets that have been embedded with greenery they resembled a beautiful fabric, the lightness complemented by the flavours of summer; and Braised Milk-Fed Veal Shank, petits farcis, vintage wine vinegar jus – deliciously tender veal, the rich dish was highly enjoyable, although I did feel that it was more an Autumn dish than one for summer, but then again the aircon is on so high its hearty, internal warming qualities were welcome.